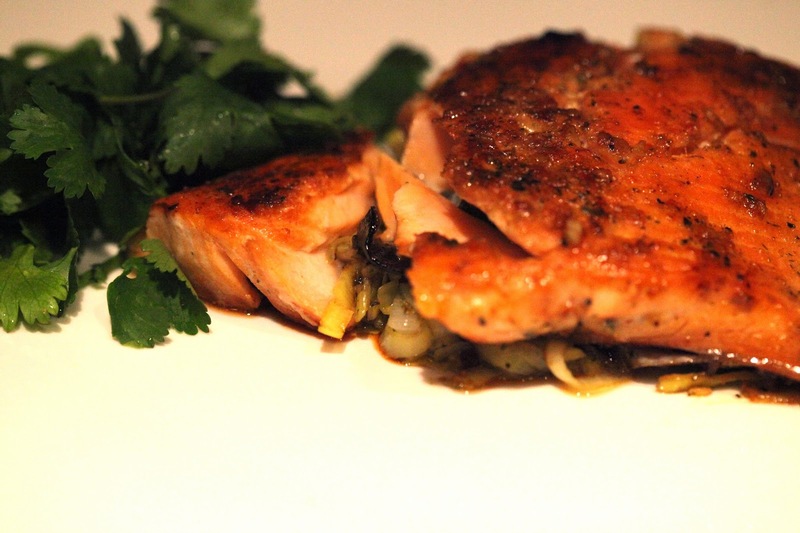 Honey Marinated Arctic Char with Leeks and Cilantro. Arctic Char is such a hearty fish, and when cooked with some tasty marinade, it can be served with just a couple complements to allow its natural flavors to shine. The first step to this dish is not pictured — but I marinated the fish the night before in a glass dish with the following: soy sauce, teriyaki, garlic, Cavenders, ginger, and honey. The honey, to me, is what sets it apart. It doesn’t overly sweeten the dish as it’s well balanced with the savory other ingredients. However, it draws the flavor of the Arctic Char nicely when cooked. In a saute pan, I heat up some garlic paste, ginger, ground mustard, and olive oil. I add to that some sliced leeks which I season with coriander and a touch of cumin. I cook the leeks for about 3-4 minutes and set them aside. Then, in the same pan, I add a touch more olive oil and start cooking my Arctic Char. I like to keep the skin on and allow it to crisp up slightly. While the fish is cooking, pour a little bit of its marinade over it to keep it moist. Serve the Arctic Char over the sauteed leeks, and you’ve got your simple dish ready to enjoy. I added some fresh cilantro for an additional flavor contrast. Total cook time, approximately 10 minutes plus 10 minutes to prep (plus overnight marinade). ← Quinoa with Spinach and Beans.